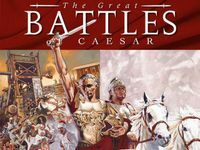 The Great Battles of Ceasar is a historical wargame using a design based on a line of board wargames published by GMT. Nine of Ceasar's ancient battles are provided and can be played as individual scenarios or within a campaign. The design emphasis of the game is on command and control, with individual units having the ability to be activated depending on their distance from a leader, with additional limitations on the number of leaders that can be utilized on any given turn. The game is played on a hexagon map, viwed from an oblique three-quarter angle which can be rotated 4 ways, giving an overall 3-D appearance. Cooperative LAN and Internet play is possible between up to 12 players, each in control of a different leader among the two sides in a battle.